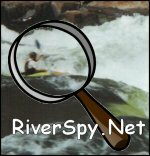 This site collects river level information from various sources and displays it in a graphical fashion that allows kayakers to quickly see which rivers are running. The data comes from the EPA, the OPW, flood warning schemes and gauges run by paddlers themselves. The one piece of the jigsaw that is still missing is data for the larger rivers that are controlled by the ESB. Hopefully this will be available in the future. Gauges are only displayed on the map if the last reading taken at that gauge is less than 48 hours old. The interpretation of what level corresponds to "scrapable","medium","huge" etc is provided by paddlers. If you think that these need to be modified for a particular river or can suggest levels for an un-calibrated river, please do so using the guestbook. These gauges have been constructed and installed by kayakers. They monitor the water level using pressure sensors and report their data using text messages. The gauge reads the level of the water every 15 minutes but to keep the phone bills down, these gauges normally send one text a day containing the data for the previous 24 hours. The Flesk gauge has recenty been modified to report every 3 hours. Gauges can also be set to report hourly if the water level is above a specified "Alert Level". Kayakers can phone the gauge directly to hear a number of beeps corresponding to the level to the current level. The data for these gauges is read from the EPA HydroNet website. The frequency of updates can vary but it is normally once per day. If the latest reading is more than 48 hours old, it will not be displayed on the map. The OPW have an excellent website at www.waterlevel.ie that contains the data for the gauges that it operates. These gauges report their data every 15 minutes, 24 hours a day. Well done to the OPW! There is only one that has been added to date, the scheme on the Bandon river. More information on this scheme can be read at www.bandonfloodwarning.ie The data is updated regularly, usually at least once an hour. A graph is also available for the level upstream at Bealaboy Br.